ACU UCP KEVLAR HELMET BANDS Military Name Tapes & Rank Insignia. Leather Flight Badges for all Branches of Service. A Foliage Green Kevlar Helmet Band w/ Cat Eyes embroidered with black thread. Pictures are as if you are wearing the helmet bands, with the cat eyes on the back of the head. ACU U.S. ARMY TAPE with Hook Fastener 1 Inch Tall by 5 Inches Long. 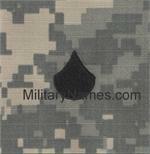 ACU-UCP RANK Insignia w/ Hook Fastener..
ACU-UCP RANK FOR PATROL CAPS.